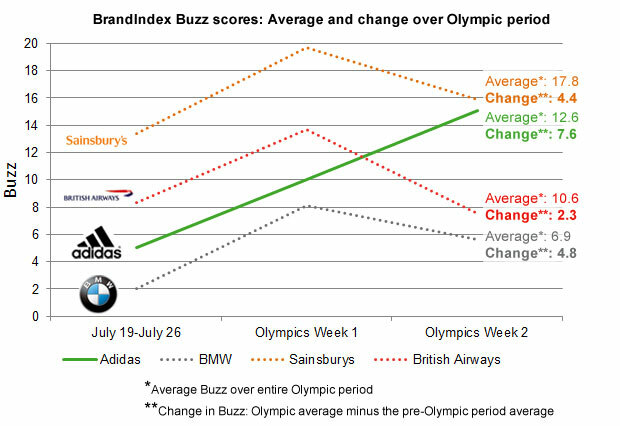 Adidas sprinted up to the top of the YouGov BrandIndex London 2012 Olympic sponsorship table by achieving the biggest gain in Buzz during the London 2012 Olympic Games. The BrandIndex Buzz score is calculated by asking a sample of UK adults if they've heard anything positive or negative about the brand in the past two weeks. The sportswear manufacturer’s Olympics campaign included a series of ‘Take the Stage’ adverts, featuring Team GB Olympic athletes including Tom Daley and Phillips Idowu, along with other stars such as Keith Lemon and David Beckham. On July 22nd, when Adidas launched a ‘Take the Stage’ advert featuring GB Heptathlon star athlete Jessica Ennis, Buzz for Adidas clearly began to climb. Before the games, Adidas had a Buzz score of +5. 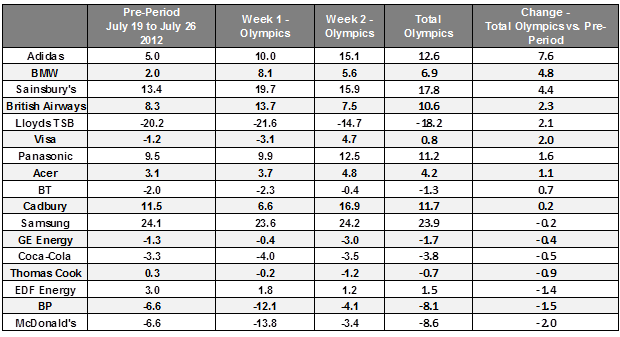 As the games began, Buzz for Adidas significantly increased and peaked at +15.1 in the second week of the Olympics. The average score for Adidas during the Olympics was +12.6, which is 7.6 points higher than where it stood during the pre-Olympic period. Other well-known brands also experienced a positive increase in Buzz during the Olympics. BMW gained 4.8 points, and Sainsbury’s had a Buzz increase of 4.4 points over the 16 days of games. BA, whose quirky Olympics campaign included a tagline telling the nation "Don’t Fly. Support Team GB and Paralympics GB”, rounded out the top four sponsors to experience the greatest increases in Buzz during London 2012.